MICROPROCESSOR CONTROLLED PLL/RF UNIT TYPE 693-2-8 SPECIFICATIONS * Frequency coverage : 380.000 to 930.0000 MHz,can be adopted to shorter frequency coverage to match spectrum used. 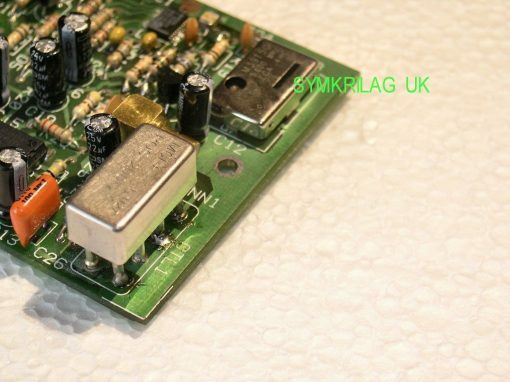 * On board standard MINI CIRCUITS POS series VCO module,type POS-900W(custom-made externally VCOs can be used). * On board precision TCXO 8Mhz module /PLL reference frequency unit. 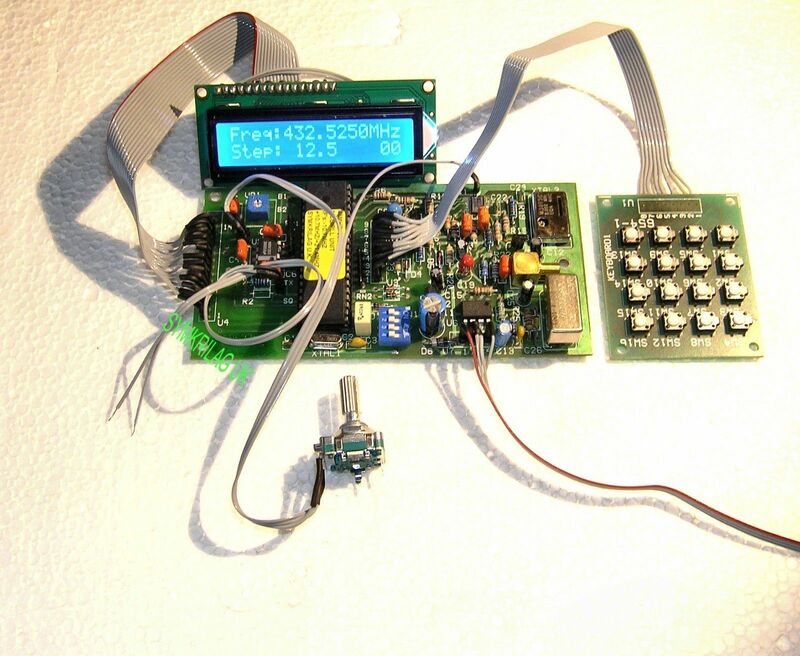 * Frequency entry(user selectable) through keyboard or rotary encoder. * Frequency step(user selectable) 10Khz,12.5Khz,25Khz,50Khz,100Khz,250Khz. * Carrier frequency,channel spacing and channel memory indicated on a 2X16 dotmatrix alphanumeric LCD display. * 4X4 matrix keyboard for data entry. * Rotary encoder for quick frequency setting/changing. * All data stored in an EEPROM,retained after power switching off. * Based on powerful Texas 77C82/42 8bit processor(OTP device). 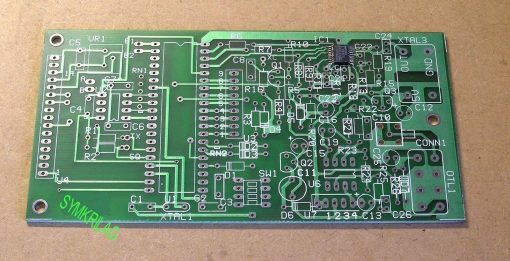 * IF setting: +10.70Mhz, -10.70Mhz, +21.40Mhz (user selectable through on board dip switches,these can be altered to specific specs,when ordering the unit), -600Khz for repeater access. * On board low/high switching points,changing condition when a pre determined frequency is crossed,useful for interchanging VCOs e.t.c. ),this point specified when ordering the unit. * Up/down scanning of frequency/memory channels. * Search stop capability. * 30 channel memory with recall. Power requirements: 12~14 V DC 120mAand 20V/10mA for VCO tuning. 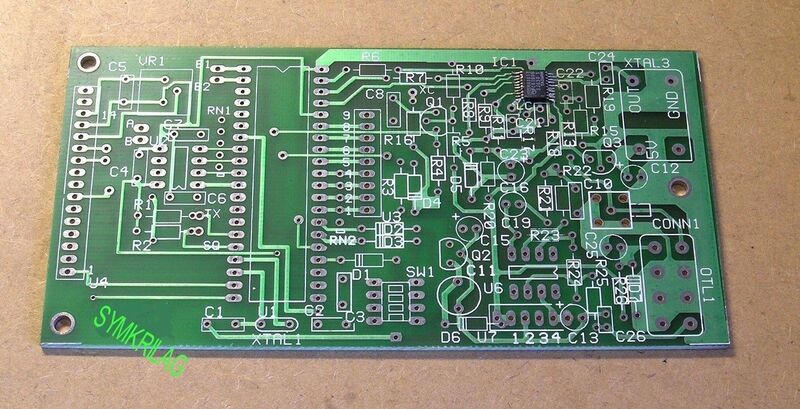 * Dimentions main board 125X62 mm,KEYBOARD 48X58X6 mm(keyboard type AK-1604-N-BWB 64X65X9 mm to order). 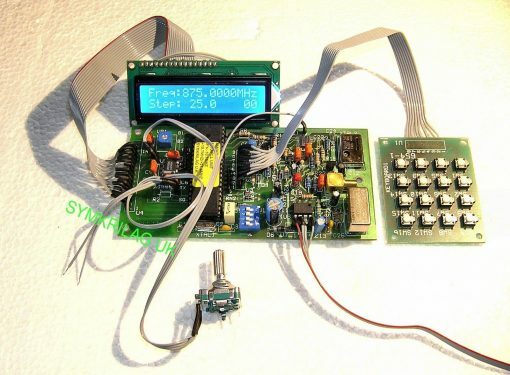 * LCD display,keyboard,rotary encoder connected to main pc board though 20cm flat ribbon cable. 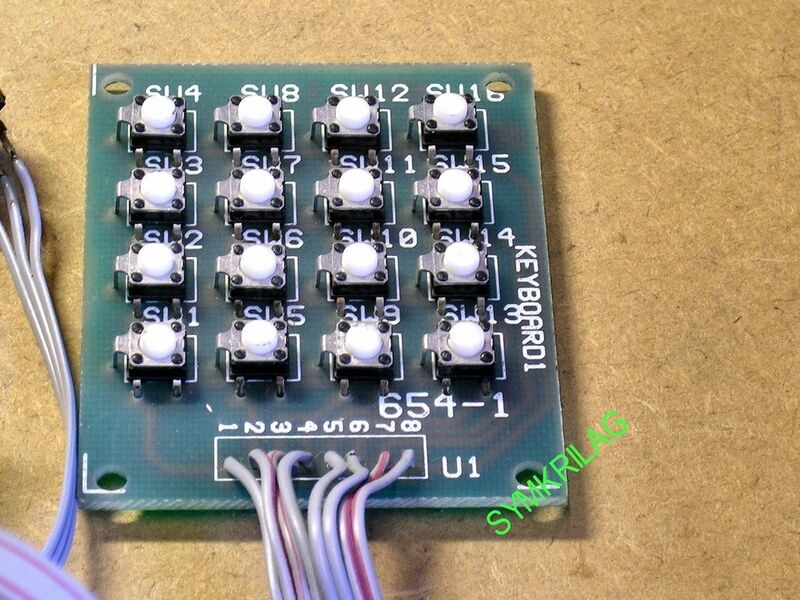 THE UNIT IS DELIVERED WITH PIN RECEPTACLES FOR THE VCO MODULE,THIS WAY YOU CAN REMOVE/CHANGE IT INSTANTLY IF NEEDED. 2. 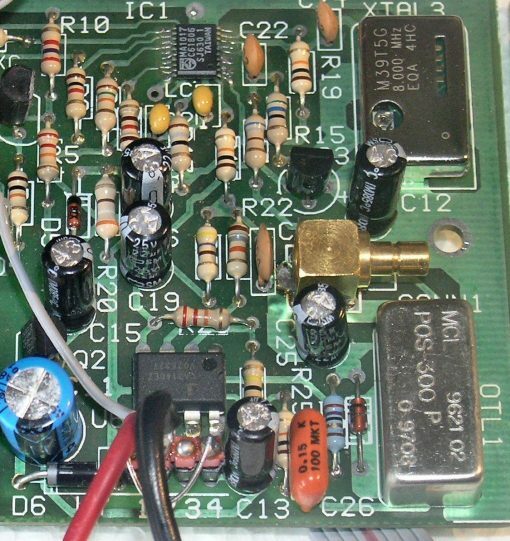 The VCO module needs a separate 20V/10mA supply to cover the full frequency spectrum as per manufacturer’s data,currect requirement is a few milliamps but MUST be stabilised and noise free. 3. In certain Receiver/Scanner applications,you should take into concideration the frequency coverage you want,for example ,if the IF frequency of a receiver is +21.40MHz and the maximum operating frequency of a specific/chosen VCO is 188MHz,then the max.operating frequency of the receiver will be: 188-21.40=166.60MHz(the receiver local oscillator needs this space! )The same occurs on the low side of the frequency coverage,when the IF needed is -10.70MHz for example. 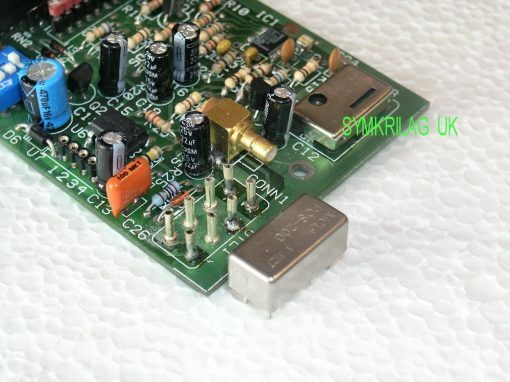 The processor has two buffered outpouts,named A and B on the main printed circuit board,one is always high ,the other low.When crossing a certain frequency point-from 48 to 999MHZ- for example 300MHz,when crossing this frequency,these outputs change condition,the high becomes low and viceversa.This can be useful if somebody wants, for example ,to use two VCOs the one following the other…YOU CAN ORDER THIS CROSSING FREQUENCY UPON ORDERING. 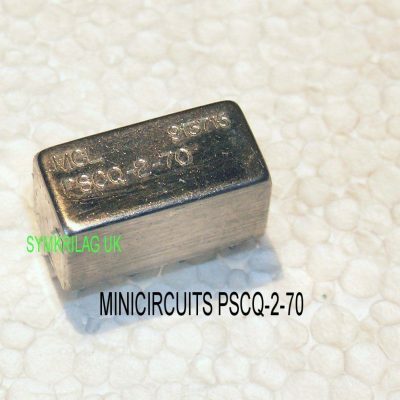 THE PROCESSOR CAN BE PROGRAMMED TO COVER A SHORTER(NARROW) FREQUENCY SPECTRUM THAN THE MAXIMUM POSSIBLE TO SUIT CERTAIN APPLICATION OR TO MATCH THE VCO USED,THIS CANNOT BE ALTERED AFTERWARDS AS THE PROCESSOR IS AN OTP DEVICE(ONE-TIME-PROGRAM). Unit will be delivered with type 154-1 keyboard,if you want type AK-1604-N-BWB,just ask for it. There is a detailed user description which accompanies the unit plus detailed electronic diagram.